There are a number of wildlife sanctuaries in Victoria. Perhaps the most popular would have to be Healesville Sanctuary. That's because it makes the occasional appearance on television commercials, although it is seemingly absent in recent times. You're probably familiar with the ancient ad where the eagle lands on the park ranger's arm and begins feeding, while the ranger introduces the bird to the closely watching audience. 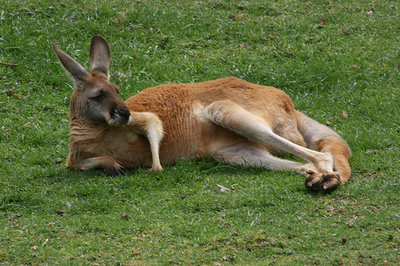 A lot of people might not be so familiar with Ballarat Wildlife Park, except the locals maybe. This is the ideal place to share your affinity with all those soft, rare Australian animals. As the sanctuary is close to Sovereign Hill, don't be surprised if you find many foreign tourists during your visit. Unlike Melbourne Zoo, where you frustratingly have to stay away from the resting kangaroos and wallabies, at Ballarat Wildlife Park you're able to physically handle and touch the marsupials. Koalas included. That they are wild animals is immaterial. They tend to be so used to human contact that you'd be amazed to find they are no different to pigeons in the city, who aren't so easily frightened away. And then there's the vast array of cold-blooded creatures, also known as reptiles. The following is a list of reptilian critters that the website lists as the primary superstars: "snakes, lizards, turtles, crocodiles and frogs." With so many of these different reptiles coming in a variety of species, strutting their stuff in diverse places within the park, you could possibly spot a mysterious creature you have never seen before. Imagine the variety of mammals. Similar to Healesville Sanctuary, there are quite a few animal shows that are run at different times throughout the day. These are normally shown in the afternoon, so try not to visit Ballarat Wildlife Park too early. But it doesn't matter if you do. You can always go on a tour, and learn a lot about the wildlife from your professional tour guide. Such walks in the park usually take place around late morning. Be sure to bring a high quality camera so that you can relive the memorable experiences over and over again. I'm quite sure you'll find something living that would make a fantastic mobile phone background picture or desktop wallpaper for your computer. It's also important that you supervise any children at all times. Little boys and girls often get so excited that they might do too much too quickly in terms of getting up close to the animals. Be careful of loose handkerchiefs or infant bibs with too much slack when near some creatures. If an emu, for instance, catches a whiff of something tasty, he or she might just attempt to gobble it all down. That can be bad for their diets. Moreover, if and when you get the chance to feed certain animals (kangaroos mainly), only feed them what the park ranger instructs you to give them. And it's not because they're on a wild Lite' n Easy dietary program. Just as dogs cannot consume chocolate and onion without suffering ill effects, the same would go for certain endangered animals in the sanctuary. Finally, it doesn't matter how severe the temptation might be, please do not litter. Not only is this an environmental hazard at the best of times, dropping rubbish here and there in the Ballarat Wildlife park can result in native animal deaths through asphyxia or left over junk food. There's also the potential for vermin like many more seagulls to be attracted to the park and they'll never get rid of them. Thankyou for a glOwing review and your advice to future visitors. Our park is privately run and costs are high but we lOve and nurture our animals and have nanny successful breedings. We live it when visitors get a kick out of patting and cuddling our animals!